$100 Rebate available until January 6th, 2007. Please visit: http://www.tomtom.com/lib/img/promo/GiveGive100.pdf for printable pdf rebate form. Plug & GO: Works straight out of the box. Portable: Easy to take from car to car. Touchscreen: Easy to operate. And no awkward buttons! Extra wide LCD screen: 4 inch high quality LCD screen with crystal-clear 3D graphics, 480x272 pixels and 64,000 colors. For optimal visibility. The latest and most complete maps: Detailed maps of the USA, Canada and Europe, all pre-installed on a 20 Gb hard disk. Allowing you seamless door-to-door navigation throughout these regions without having to switch maps. Route choice: Plan your route to fit your requirements, such as: quickest, shortest, and avoiding toll roads, by required arrival time, etc. Points of Interest: Restaurant, parking garage, movie theater or gas station. 1000�s of POI�s pre-installed. Search by proximity to current location, on your route, near a specific city, etc. 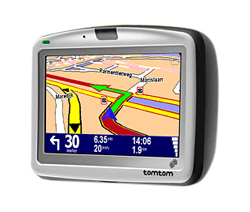 Huge choice: TomTom GO 910 speaks 36 languages in over 50 different voices. Bluetooth� connectivity: Connect your GO to your mobile phone, headset, car speakers or headphones hassle-free with Bluetooth� technology. 20 Gb hard disk: With 12 Gb free, TomTom GO 910 has enough space for 1000�s of your songs, photos and more besides. mp3 player: Play your stored music and audiobooks on the built-in mp3 player through the high quality GO speaker or via your car stereo, and even manage your music using the ingenious TomTom Jukebox. Remote control: You or a passenger can operate your GO from anywhere in the car. Making your journey easier and safer. Home dock: Our easy-to-use home dock is the smart way to download from your pc or Mac, upgrade your GO and manage your files, all while automatically charging your device. Real-time traffic: Up-to-the-minute traffic information, jam alerts and road condition warnings. Real-time weather reports: A real-time overview of the weather before you leave, including 5-day forecasts for the place you�re going. Safety cameras: Receive and report alerts when there are safety cameras coming up, fixed or mobile.